we milk 3. Our Jersey and two 8 of Cooks. I sell some butter but not like I did a while ago we had a separator and that helped a good deal. Bale reaping bought it and Pete said it dried their cows up and so we borrowed it of them they want to sell it to us but we couldn't afford to buy it we won't have much use for it next summer it cost $6.00 and I think that is to much for ti. 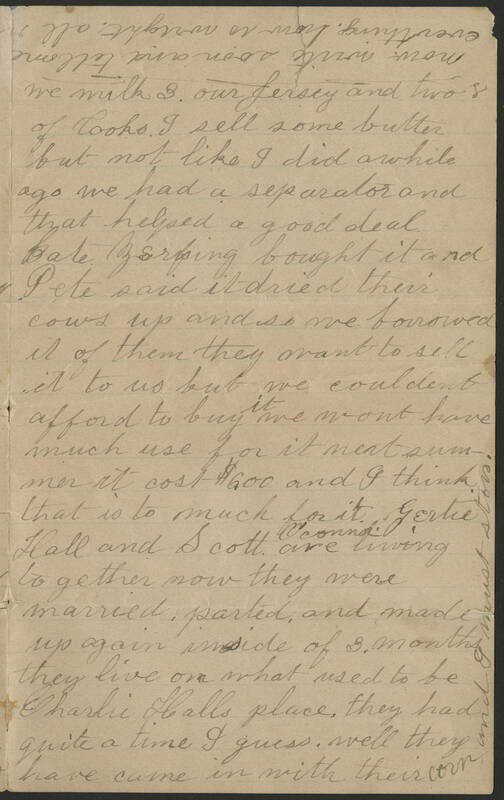 Gerke Hall and Scott are [illegible] living together now they were married, parted and made up again inside of 3 months. they live on what used to be [illegible] Halls place they had quite a time I guess. Well they have came in with their corn and I must stop.